I love Sunday brunch; something about getting together with friends and family over a delicious breakfast filled with more exotic breakfast items than the standard egg dish is so appealing to me. I love the excitement of tasting dishes that are not something I eat most mornings, and the old me especially loved french toast with maple cured bacon and fresh fruit. While I haven’t had bread in ages, I have to admit that I occasionally miss it. I used to love my husband’s french toast; he has a way with egg-soaked, sweetened bread that just makes me happy 🙂 So when I ran across this recipe for a gluten free Spiced Banana French Toast on Goodbye Gluten’s site, I adapted their recipe to mirror our french toast and updated it a bit to be in-line with allergy-free diet. If you’re avoiding alcohol, try pairing it with this fun and tasty non-alcoholic Orange Spritzer for a twist on the mimosa. 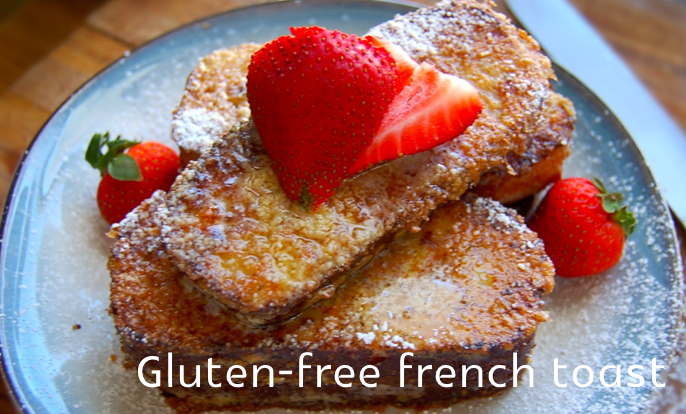 While I can’t speak to the quality of their products, I always liked our gluten free french toast with a light white bread, and often use Udi’s or Canyon Bakehouse. And while I no longer enjoy french toast myself, I’m happy that my son can experience it occasionally. Because of the glycemic effect of this recipe it’s not something I suggest you have often. Save it for a rare occasion and truly savor it, and be sure to follow it up with a protein packed dinner to balance it out. Remember folks – life is all about balance, whether it’s allergy-free living, or life in general. So go ahead and enjoy this delish dish, but add some protein for a dietary balance (think bacon or sausage) that will help keep you happy & satisfied while your glucose levels will enjoy a small but balanced spike. In a small saucepan, melt brown sugar, butter, agave syrup and oil over medium heat, stirring until it reaches a light boil. Reduce heat to low; stir in banana slices. In a large bowl, beat eggs; blend in milk, vanilla , allspice, and sea salt. Soak each slice of gluten-free bread in egg mixture for 30 seconds per side and rest on plate (repeat if necessary). Spray a skillet or griddle pan with canola spray and pre-heat on medium. Cook each slice 3-4 minutes per side or until toast is lightly browned. 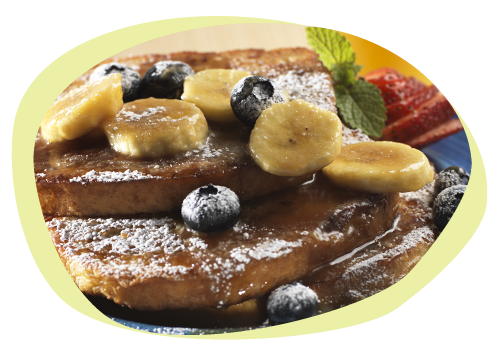 Spoon banana sauce over French toast as desired and serve immediately. Sprinkle with confectioner’s sugar, if desired. Delighted to find your site – such lovely receipes! !